You wouldn’t be doing some reading on the NRS website unless you are an outdoors person. What’s more, you probably wouldn’t be reading this article unless you have kids, grandkids or other young people in your life. 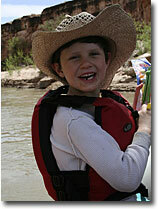 You love the outdoors and you can help spread that passion to the younger generations. Many children today don’t have the same access to the natural world as previous generations. There are multiple reasons for this. More people are living in urban and increasingly urbanized suburban areas. Many parents are apprehensive, often with good reason, about letting their kids roam unsupervised. In many households, both parents work, limiting the time they have to supervise outside play and exploration. Video games and other forms of electronic entertainment are plentiful and seductive. And kid’s lives have become much more scheduled, with parents shuttling them between sports practice and games, music lessons, after school activities, etc. Many researchers in childhood development and environmental education think it is. They find that exposure to positive experiences in natural environments improves creative problem solving skills and creativity. It also aids in the development of imagination and motivates life-long learning. Being in nature lowers stress and builds a connection to the earth that is important for creating an environmental consciousness. What can we as adults do to give our young people the gift of a nature education? First, it’s about making the time to take them out and let them play in the outdoors… not in a manicured park with manufactured playground equipment, but in the rough and dirt and wet. And it doesn’t have to be out in the wilderness. Most places have areas of underdeveloped land sufficiently accessible for your purposes. Henry's happy to be on the water. With young children, you don’t have to worry with a lot of organized activities. Just let them roam and romp and play. They’ll find creative ways to amuse and entertain themselves. Older children can enjoy games of plant and animal identification, looking for animal tracks, collecting leaves and plant seeds, etc. Keeping an outdoor journal that they can draw and write in can be educational and fun as well. Make a place at home where they can display their collected treasures. Many local conservation groups sponsor land restoration projects and nature excursions that can be fun for the whole family. Scouting teaches many outdoor skills and fosters self-challenge and leadership. Many museums have nature programs and field trips for all ages. Some summer camps have a nature-oriented curriculum. 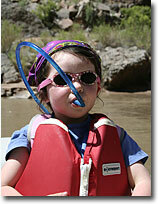 And of course, camping and boating with your young people offer many opportunities for learning, fun and exploration. Ainsley stylin' and staying hydrated. Make sure they have nourishing snacks. Playing in the outdoors makes ‘em hungry. Get them their own water bottle; help them decorate it with stickers. Dressing them in bright clothes makes it easier to keep track of them. Give them a whistle and teach them how to use it for signaling if they get separated from you—three blasts repeated at intervals until they’re located. Get them a small daypack to carry their snacks, water, sunscreen and the rocks and other stuff they’ll collect. In areas where there are poisonous plants, insects and reptiles, teach them skills like identifying those hazards and being careful where they place hands and feet. Read “Kid’s Safety” and the other articles in the right sidebar for more tips. Most of all just get out there with them! They’ll have fun and so will you. Mowing the lawn and vacuuming the living room can wait. Kids grow up fast. 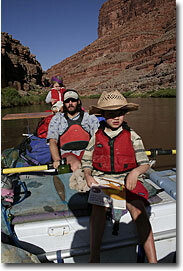 Spend the time in those early years to create lifelong outdoor enthusiasts. Enjoy the outdoors and Be Safe!